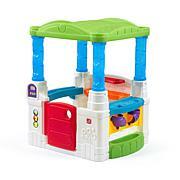 Kids can host their own backyard celebration with this open playhouse with canopy! 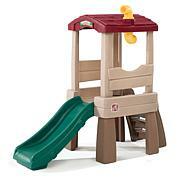 This kiddo’s playhouse features an attractive and realistic stone-stacked design will blend into any backyard setting. 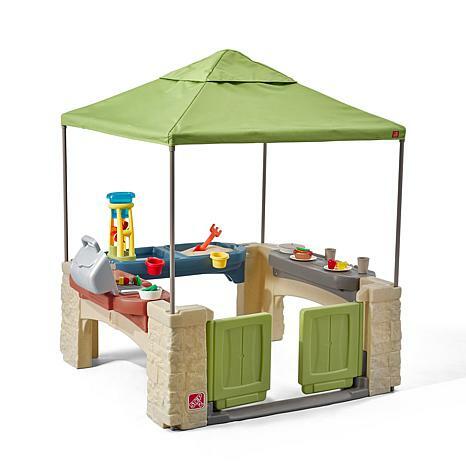 Little ones will be able to entertain for hours with the pretend play kitchen grill, to cook up their favorite grub just like Mom and Dad. 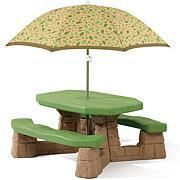 Little ones will enjoy the wait for “dinner” with the attached sand and water play table. Once dinner is ready, children can eat at the snack table with the included dish set to complete the ultimate game of “restaurant”. Made in USA of US and imported parts. Spacious interior and high canopy offers plenty of room for social and interactive play. Open pavilion-style design is perfect for outdoor fun in the sun! Kitchen grill with sink and swivel faucet allows kids to "grill up" their favorites meals. 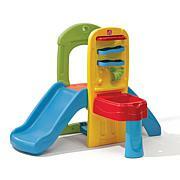 Sand and water play area features several accessories and lid for splish-splash fun! Snack table features an included dish set. Adult assembly required. Item dimensions: 60x52x54 in. Age range: 2+ years. Limited 3 year manufacturer warranty 800-347-8372.